With the help of a tracking device on a laptop computer, Elk Grove Police arrested one adult and a juvenile on suspicion of an early-afternoon residential burglary. Shortly before 1 p.m on January 3, Elk Grove Police responded to the 9400 block of White Horse Way on the city's north side regarding an in-progress burglary. The caller indicated that two unknown suspects were inside the residence and had fled after they had discovered there was an occupant in the home. Responding officers established a perimeter but were unable to locate the suspects. The victim advised that a laptop and been stolen during the burglary and the homeowner was able to provide a surveillance video of the suspects from inside the residence. Just before 4 p.m. police officers responded to the 8800 block of Bond Road after the owner of the stolen laptop had tracked the device to this location. 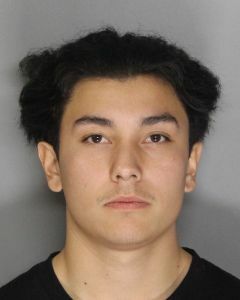 Responding officers contacted 18-year old Christian Silva (pictured above) and a 15-year old male juvenile accomplice, both of whom matched the description of the suspects involved in the residential burglary. A records check revealed that Silva was on probation and a subsequent search his backpack led to the discovery of the stolen laptop and marijuana. A probation search of Silva's residence resulted in the discovery of the clothing that he and his juvenile accomplice had worn during the burglary. Silva was arrested and booked into the county jail where he is being held on $50,000 bail and faces two felony and two misdemeanor charges with his arraignment scheduled for January 5. The juvenile was taken into custody then transported to juvenile hall.